Jesse Boy restaurant in Hollywood is making donations from sales of its Jesse Boy Bowls to Children’s Hospital Los Angeles through March 31. 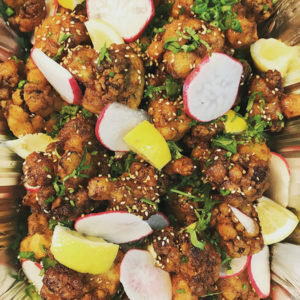 Jesse Boy, a Korean fried chicken and fried cauliflower restaurant, is dedicated to raising awareness and funds for CHLA. The $1 per bowl donations are part of the hospital’s “Make March Matter” program. Jesse Boy Bowls can be ordered as vegan, vegetarian and non-vegan. The bowls start with a bed of jasmine rice topped with house salad dressing and aioli, a choice of Korean fried chicken or fried cauliflower, and house salad, ponzu and pickled radishes. Jesse Boy also offers Korean fried chicken (wings or tenders) and Korean fried cauliflower (vegan) with sides of jasmine rice, fries and sesame salad. Hand-crafted agua frescas are made daily using seasonal fruit. Jesse Boy is located at 6254 Santa Monica Blvd. For information, visit jesseboyeats.com and makemarchmatter.org.